Author: Stepanov S., Suvorov A. We propose a model in which an entrepreneur, seeking outside financing, sells a large equity share to an outside blockholder in order to signal his low propensity to extract private benefits. A conventional theoretical rationale for the presence of an outside blockholder is mitigation of the agency problem via some type of monitoring or intervention. Our model provides a novel insight: outside blockholders may be attracted by firms with low, rather than high, agency problems. Our result yields a new implication for the interpretation of an often documented positive relationship between outside ownership concentration in a firm and its market valuation: such relationship may be driven by "sorting" rather than by a direct effect of blockholder monitoring. In fact, we show that the positive correlation may arise even if the blockholder derives private benefits and has no positive impact on the value of small shares. Finally, we argue that our analysis may help explain why the market reacts more favorably to private placements of equity as opposed to public issues. Author: Sokolov V., Brown M., De Haas R.
We exploit variation in consumer price inflation across 71 Russian regions to examine the relationship between the perceived stability of the domestic currency and financial dollarization. Our results show that regions with higher inflation experience an increase in the dollarization of household deposits and a decrease in the dollarization of loans. The impact of inflation on credit dollarization is weaker in regions with less integrated banking markets. This suggests that the currency-portfolio choices of households and firms are constrained by the asset-liability management of banks. Author: Boulatov A., Bernhardt D.
We analyze a static Kyle (Continuous auctions and insider trading. Princeton University, Princeton, 1983) model in which a risk-neutral informed trader can use arbitrary (linear or non-linear) deterministic strategies, and a finite number of market makers can use arbitrary pricing rules. We establish a strong sense in which the linear Kyle equilibrium is robust : the first variation in any agent’s expected payoff with respect to a small variation in his conjecture about the strategies of others vanishes at equilibrium. Thus, small errors in a market maker’s beliefs about the informed speculator’s trading strategy do not reduce his expected payoffs. Therefore, the original equilibrium strategies remain optimal and still constitute an equilibrium (neglecting the higher-order terms). We also establish that if a non-linear equilibrium exists, then it is not robust. Author: Betschinger М.-А., Bertrand O., Settles A. In the context of economic nationalism, we investigate the relevance of political affinity between countries to the initial acquisition premium offered in cross-border acquisitions. Political affinity is defined as the similarity of national interests in global affairs. We argue that political affinity affects how foreign acquirers anticipate their bargaining position in their negotiations with domestic target firms. With decreasing political affinity, the host government becomes increasingly likely to intervene against foreign firms in an acquisition deal. Consequently, foreign acquirers need to provide a more lucrative initial offer to dissuade target firms from leveraging government intervention to oppose the acquisition. Our prediction is supported by strong evidence that political affinity, as revealed by UN general assembly voting patterns, leads to lower initial acquisition premiums. The study explores the role of banks as debt and equity holders for the riskiness of a firm's investment strategy using a panel of Japanese firms in the electronics industry in the period 1992–2004 for the empirical analysis. Based on a conceptual framework grounded in agency and financial intermediation theories, we find that a larger involvement of banks as debt holders in a firm is associated with lower foreign direct investment portfolio risk, while the shareholdings of universal banks increase it, supporting the theoretical predictions. Author: Peiris U., Vardoulakis A. This paper argues that in a monetary Real Business Cycle economy where a complete set of nominal contingent claims exist, the requirement to collateralize loans, alone, does not affect the equilibrium allocation when monetary policy is chosen optimally: The Pareto optimal allocation can be supported. A Friedman rule ( r = 0), which would be optimal in the absence of collateral constraints, here is not. At the resulting prices, collateral constraints bind and the allocation is inefficient. However, positive interest rates (through an inflation tax on money balances) support the Pareto optimal allocation when the collateral constraint binds. Author: Peiris U., Tsomocos D.P. Journal of Mathematical Economics, Volume 56, January 2015, Pages 47–57. We present an integrated framework for the study of the international financial economy with trade, fiat money, monetary and fiscal policy, endogenous default and regulation. Money is introduced via a cash-in-advance requirement and real trade is endogenous. The standard international finance pricing results obtain. Market incompleteness and positive default in equilibrium allow for the study of the transmission of default through the international financial markets and imply a positive role for policy. Finally, we present an example where, due to the trade-off between the non-pecuniary cost of default and the resulting allocation, a Pareto improvement occurs following an increase in interest rates. 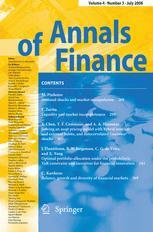 Journal of Empirical Finance, Volume 29, December 2014, Pages 247-265. We investigate the rationale and impact of the corporate debt subsidization program implemented by the Russian government during the recent financial crisis. Employing the difference-in-difference approach, we show that the program did not have a significant impact on capital investments of subsidy recipients, contrary to its intentions. We also find that a matched group of non-recipients on average exhibited a higher degree of cash hoarding behavior than subsidy-recipients in the post-program period, which suggests that the program eased external financial constraints of recipient-firms. Consistent with the theory on precautionary cash savings by firms, we further find that firms non-recipients based in cities with low banking development accumulated more cash holdings than recipients based in cities with a high banking development. Overall, our findings indicate that greater cash holdings are positively associated with the level of financial constraints of firms. Author: Stepanov S., Enikolopov R., Petrova M.
Journal of Banking & Finance, Volume 46, September 2014, Pages 72-84. Recent empirical research suggests that country-level and firm-level governance institutions are substitutes with respect to their effect on firm value. In this paper we demonstrate that during a crisis these institutions may actually become complements. Specifically, we find that the decline in companies’ valuation during the financial crisis of 2007–2009 was more sensitive to firm-level transparency in countries with stronger investor protection. We propose a theoretical model that reconciles our findings with the results in the literature. In our model, during “normal times” strong firm-level governance is crucial to attract outside financing in countries with weak investor protection, but is less important in countries with good investor protection. During a crisis, however, investment opportunities decline even in countries with strong investor protection, and, as a result, relative importance of firm-level governance increases in such places. Author: Boulatov А., Taub B. We revisit Kyle's (Econometrica 53:1315-1335, 1985) model of price formation in the presence of private information. We begin by using Back's (Rev Financ Stud 5(3):387-409, 1992) approach, demonstrating that if standard assumptions are imposed, the model has a unique equilibrium solution and that the insider's trading strategy has a martingale property. That in turn implies that the insider's strategies are linear in total order flow. We also show that for arbitrary prior distributions, the insider's trading strategy is uniquely determined by a Doob h-transform that expresses the insider's informational advantage. This allows us to reformulate the model so that Kyle's liquidity parameter λ is characterized by a Lagrange multiplier that is the marginal value or shadow price of information. Based on these findings, we can then interpret liquidity as the marginal value of information. This study is dedicated to an important aspect of the long-run performance of firms, namely their survival under rapidly changing conditions in a transition economy. The analysis is focused on the question of whether privatization and ownership structure have affected the likelihood of liquidation and bankruptcy of firms in Russia. We use a sample of 497 privatized and non-privatized firms that were surveyed in 1999-2000, and for which information was collected about their survival status and reasons for exit, such as bankruptcy, mergers and court decisions. More than 38% of the sample firms were liquidated over the period 1999 to 2013. We find that privatization and the choice of privatization option have no effect on the long-term survival of firms in Russia, but that managerial ownership lowers the likelihood of both liquidation and bankruptcy. Other transition-specific predictors of bankruptcy, such as the extent of price controls and the amount of wage arrears, affect firm exit in a significant way. Should outside blockholders be more common in countries with weaker shareholder protection? I show that there can be a U-shape dependence of the outside ownership concentration on the quality of shareholder protection. This result is in line with the recent empirical evidence questioning the traditional law-and-finance view. In my model, a lower cost of private benefit extraction makes outside monitoring less desirable for an entrepreneur, thereby calling for a smaller outside blockholder's share. However, a low blockholder's share may provoke collusion between the entrepreneur and the blockholder, which hampers raising funds from dispersed shareholders. This trade-off yields the described U-shape relationship. We examine the impact on the quality of a securities market of hiding versus displaying orders that provide liquidity. Display expropriates informational rents from informed agents who trade as liquidity providers. The informed then exit liquidity provision in favor of demanding liquidity where they trade less aggressively. Trading costs to uninformed liquidity demanders are higher, bid-ask spreads are wider, and midquotes are less informationally efficient when orders that provide liquidity are displayed. Our analysis suggests that market innovations, which might seem to favor the informed over the uninformed, can enhance market quality by intensifying competition among the informed. We study a monetary economy with two large open economies displaying net real and financial flows. If default on cross-border loans is possible, taxing financial flows can reduce its negative consequences. In doing so it can improve welfare unilaterally, in some cases in a Pareto sense, via altering the terms of trade and reducing the costs of such default. In the presence of uninsurable idiosyncratic risk, the optimal credit contract allows for the possibility of default. In addition, the optimal contract incorporates a precautionary savings motive over and above what agents would otherwise save. When default is sufficiently high, credit markets may collapse. A regulatory requirement on the level of savings can increase risk sharing and improve welfare by increasing the gains to trade in credit exchange. Under the appropriate verifiability condition on the level of savings, an appropriate market structure, agents voluntarily increase their level of storage such that trade and welfare improve. This paper examines how the 2005 shift in Russian exchange rate policy from US dollar (USD) single-currency to USD–EUR (euro) bi-currency targeting has impacted domestic interest rates. The finding show that this policy shift has disconnected Russian interest rates from US dollar-denominated interest rates, while instead linking them to a synthetic interest rate composed of USD and EUR rates at the same proportion as that of these two currencies in the currency basket against which the ruble's exchange rate is set. The Russian experience shows that while the adoption of bi-currency targeting may help ensure that domestic interest rates are less dependent on the monetary cycle of a single country, these rates are instead likely to reflect financial developments in all countries whose currencies are included in the currency basket. This insight is likely to be relevant for other countries that pursue basket-targeting policies. Keywords: foreign borrowing; bailout, banks, crisis. Autohor: Boulatov A., Hendershott T., Livdan D.
We solve a multi-period model of strategic trading with long-lived information in multiple assets with correlated innovations in fundamental values. Market makers in each asset can only condition their price functions on trading in that asset (but not on trading in the other asset). Using daily non-public data from the New York Stock Exchange we test the model's predictions on the conditional and unconditional lead-lag relations of institutional order flows and returns within portfolios. We find support for the model prediction of positive autocorrelations in portfolio returns as well as the predictions for how informed order flow positively predicts future returns and future informed order flow. As the model predicts we find these relations strengthen for portfolios formed from assets with higher correlation of fundamental values. Authors: Boulatov A., Dieckmann S.
We study the risk sharing implications that arise from introducing a disaster relief fund to the cat insurance market. Such a form of intervention can increase efficiency in the private market, and our design of disaster relief suggests a prominent role of catastrophe reinsurance. The model predicts buyers to increase their demand in the private market, and the seller to lower prices to such an extent that her revenues decrease upon introduction of disaster relief. We test two predictions in the context of the Terrorism Risk Insurance Act (TRIA). It is already known the introduction of TRIA led to negative abnormal returns in the insurance industry. In addition, we show this negative effect is stronger for larger and for low risk-averse firms -- two results that are consistent with our model. The seller's risk aversion plays an important role in quantifying such feedback effects, and we point towards possible distortions in which a firm may even be overhedged upon introduction of disaster relief. Author: Betschinger M.-A., Bertrand O. This paper investigates the long-term impact of domestic and international acquisitions, initiated by Russian firms, on their operating performance. In general, acquisitions can be associated with synergy gains, internalization advantages, and higher market power. Acquisitions, however, may also give rise to agency problems as well as new integration and organizational costs, leading to an ambiguous overall impact on the performance of acquirers. Based on a sample of more than 600 acquirers we show that both domestic and international acquisitions tend to reduce the performance of acquirers compared to non-acquiring firms. Examining how different deal, firm and industry level characteristics moderate the value destroying effects of acquisitions, our results suggest that Russian acquirers suffer from the inability to leverage value due to low M&A experience and capability, especially when making international acquisitions. Author: Gelman S., Burhop C.
MPI Collective Goods Preprint 2011, No. 2011/19, 56p. We analyze the determinants of illiquidity and its impact on asset pricing for purely call-auction traded stocks on Berlin Stock Exchange using 22 years of daily data (1892-1913). We use the Lesmond et al. (1999) measure of transaction costs to proxy illiquidity. We show that transaction costs were low and comparable to today’s costs. Liquidity was negatively correlated with active informed trading, particularly being low for small and distressed stocks and in crises times. Liquidity concerns were a major driver of asset pricing: we find significant illiquidity level and illiquidity risk premia as well as an explicit premium for informed trading. We use a large data set of Russian manufacturing firms to describe the ownership structure in the Russian industry at the end of the mass privatization program in 1994 and its subsequent evolution. The data shows a high, but gradually decreasing ownership stakes of firm insiders (managers and workers). We estimate the effect of a wide range of firm characteristics on the decision to privatize, the initial ownership structure after privatization, and on subsequent changes of ownership stakes. We test and find support for several predictions of the model by Aghion and Blanchard (1998). For example, collusion among workers makes them more reluctant to sell shares to outsiders. Firms in financial distress show a higher incidence of insiders selecting the option of privatization leading to high insider ownership. This can be explained by their desire to insure against unemployment in the case of restructuring by outsiders. No evidence is found of a sequencing in privatization according to the performance of firms before privatization. A methodological novelty of this paper is the application of a tobit model with sample selection to the choice of ownership stakes. Author: Sokolov V., Lee BJ., Mark N.
From a panel of 137 countries over the years 1971 to 2002, we find evidence that an exchange rate policy of "fear of foating. (de jure foat and de facto peg) is associated with superior macroeconomic performance in non-industrialized countries. We examine four different measures of performance- per capita GDP growth, ii) the CPI inflation rate, iii) GDP growth volatility, and iv) inflation volatility - and how they respond to a 'words versus deeds' measure of exchange-rate policy obtained by interacting a country's de jure exchange rate policy with its de facto policy as codified by Rogoff and Reinhart (2004). For non-industrialized countries, the highest GDP growth rates are associated with those who pursue fear of .fating whereas the lowest inflation rates are achieved by countries that pursue a matched fix (de jure and de facto fixing). Countries that exhibit fear of foating also experienced the lowest GDP and inflation volatility while those that pursued a matched de jure and de facto .oat experienced the greatest macroeconomic instability. Author: Gelman S., Saldakeeva O., Smirnova G.
The Global Financial Crisis of 2007-2009 has highlighted the resilience of the financial markets and broader economies from the developing world. This outcome owes much to the bitter experience and economic strategies developed and implemented at both a national and international level following the Asian Financial Crisis of 1997-1998. The objective of this volume is to investigate and assess the impact and response to the crisis from an emerging markets perspective including asset pricing, contagion, financial intermediation, market structure and regulation. Our hope is that the assembled papers will offer clear insights into the complex financial arrangements that now link emerging and developed financial markets in the current economic environment. The volume spans four dimensions: first, a series of background studies offer explanations of the causes and impacts of the crisis on emerging markets more generally; then, implications are considered. The third and final sections provide insights from regional and country-specific perspectives. Author: Sprenger C., Urosevic B. This chapter provides a quantitative analysis of the housing and housing finance markets in Russia and its regions. Russia has experienced a sharp decline in mortgage lending at the end of 2008 and beginning of 2009 as a response to the liquidity problems in international financial markets. The decline in house prices has been, however, only moderate. The chapter focuses on the differences in prices and market conditions in Russia's regional housing and mortgage markets. It identifies the main drivers of housing prices using panel data for 80 Russian regions. Furthermore, the chapter discusses the default experience of mortgage loans during the crisis. The difference in default rates between ruble and dollar-denominated mortgage loans is discussed in connection with the large ruble depreciation in 2008 and 2009. Foreign companies often forego high profile corporate investments in developing markets fearing regulatory opacity, investment barriers, or political instability. Host and investor home governments can develop appropriate strategies to mitigate such risks and attract FDI into these markets. One policy tool available to achieve this goal is bilateral or multi-lateral investment agreements. This study focuses on bilateral investment treaties and preferential trade and investment agreements and explores if and under which conditions these treaties promote different types of foreign direct investment. The empirical evidence involves Japanese multinational firms’ activities abroad. HSE Working Paper Series 9 «Research in economics and finance», no. 2010/03, 51p. 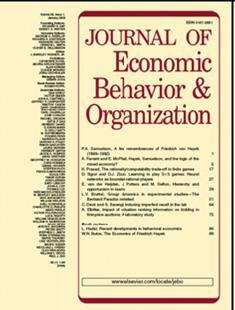 This paper computes the optimal executive compensation in an infinite-horizon moral hazard framework characterized by limited commitment and history-dependent reservation utilities. The model is given a recursive form and some properties of the state space are established. I derive a sufficient condition for the optimal contract to provide the CEO with insurance against fluctuations in the value of his/her outside options under short-term history dependence. In the numerical computation of the endogenous state space, I use an innovative algorithm which does not rely on the convexity of the underlying set. Exerting effort appears to be the predominant strategy for the principal, but shirking may still be optimal when the manager is rich enough. The optimal wage scheme and the future utility of the CEO tend to grow in both his/her current utility and in the firm’s future profit. The manager’s utility tends to increase weakly in the long run and appears to have a non-degenerate long-term distribution depending on the initial utility promise but not on the initial history. HSE Working Paper Series 9 «Research in economics and finance», no. 2010/02, 41p. This paper considers a moral hazard problem in an infinite-horizon, principal-agent framework. In the model, both the principal and the agent can commit only to short-term (single-period) contracts and their reservation utilities are allowed to depend on some finite truncation of the history of observables. After existence is proved, the original problem of obtaining the optimal incentive- compatible self-enforcing contract is given an equivalent recursive representation on a properly defined state space. I construct an auxiliary version of the problem where the participation of the principal is not guaranteed. The endogenous state space of agent’s expected discounted utilities which on a different dimension includes the set of truncated initial histories in order to account for their influence on the reservation utilities is proven to be the largest fixed point of a set operator. Then, the self-enforcing contract is shown to be recursively obtainable from the solution of the auxiliary problem by severely punishing any violation of the principal’s participation constraint. Author: Burhop C., Gelman S.
Bonn, Max Planck Institute for Research on Collective Goods, 2010, 23p. We estimate effective spreads and round-trip transaction costs at the Berlin Stock Exchange for the period 1892-1913 using daily stock market returnsfor a sample of 27 stocks. Our results show that transaction costs at the main stock exchange in a bank-based financial system at the turn of the 20th century were quite low and about comparable to transaction costs in modern markets. Nonetheless, transaction costs varied substantially over time andacross securities, whereby the cross-sectional variation could be substantially explained by firm size and time variation by crises. Furthermore, we find surprising evidence that transaction costs decrease the expected excess returns. Thereby size and momentum premia are of expected signs while market beta has no significant influence on the cross-sectional return variation. Author: Gelman S., Wilfling B. The paper examines shifts in the market betas and the conditional volatility of stock prices of takeover targets. Using daily stock prices of five European and American targets, we find that adequately specified Markov-switching GARCH models are capable of detecting statistically regime-switches in all takeover deal-types (in cash bids, pure share-exchange bids, mixed bids). In particular, conditional volatility regime-switches are found to be most clear-cut for cash bids. Our economic findings have implications for a broad range of financial applications such as the valuation of target stock options.